Teacup Ninja – Page 5 – Teacups. Ninjas. Maybe some other stuff? I don’t remember what inspired me to try cosplay. My mother is very good at sewing and I have a knack for patterns, iron-on designs, and crafting props. 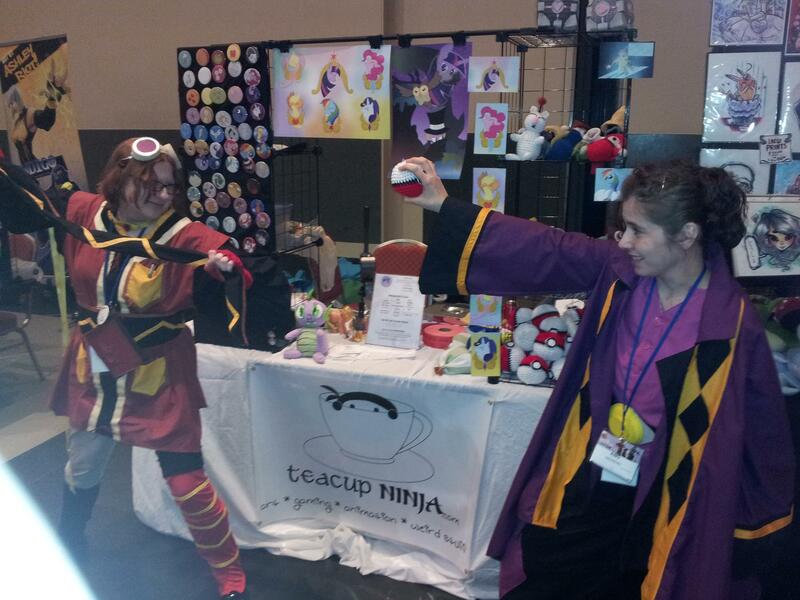 Cosplay quickly became a way to bond with my mother, and showing her my interests. To tell the truth, I thought she’d hate the idea, but she never even asked for anything but the supplies, and she saw each strange costume as a new challenge. We started small, and then got into more complex designs later on. This started in 2001, and I did a total of two cosplays that year. My first was Naru Narusegawa from Love Hina, followed by Duo Maxwell of Gundam W.
I was really proud of my work, and I think we came a long way over the past 13 years. I wore those costumes to one con in 2001 and another con in 2003. I realized I could still fit in the Duo costume in 2012, and while it’s not as well done as my latest work, it still holds up real well at a crowded con. 2003 and 2004 kind of meshed together for me; I’m not sure which costume got worn where, but we made five new costumes over those two years. Reiko Asagiri from Gatekeepers, Tsukasa from .hack//SIGN, Kanako Urashima from Love Hina, Teletha “Tessa” Testarossa from Full Metal Panic!, and Jr. from Xenosaga. Xenosaga was the first video game I made a cosplay for, and everything before that was from anime. I hated the wig for the Jr. Cosplay, so in 2005 I made a better one, by cutting up a wig with the right shade of red into his hairstyle. We made two new costumes that year as well; Athrun Zala from Gundam SEED and Michelle Chan from R.O.D. : the TV. After that, I slowed down for a while. We made a boy’s uniform from Ouran High School Host Club, but I never decided on which character to finish it off with. We stopped for a few years for many reasons. I got married, had some weight problems, and things were just overall very hectic. I almost thought I lost interest, but in 2009, I decided to get a table at the artist alley of my local convention in Boston, MA. While I was sitting there, watching the people, it got me thinking, “I miss it.” To my surprise, when I brought it up with my mother, she said she missed it too. In 2010, we made a costume of one of my favorite characters from the JRPG, Tales of Vesperia, Rita Mordio. That was when I realized how much I enjoyed JRPGs, especially the “Tales of” series. I started to center my a lot of my cosplay around games, and in the future I’m hoping to do a lot more “Tales of” cosplay. Along with Rita, I also did a version of the female Commander Shepard’s dress uniform from Mass Effect 2. I finished a costume that took two years to complete in 2011, as well as my first team cosplay costume. My best friend really likes Final Fantasy XIII, so she wanted to be Lightning and I decided to dress up as Lightning’s sister, Serah. The costume that took two years was our most detailed work. The character was Llyr from the PS3 JRPG Tears to Tiara. The games are not available in the U.S., but the anime version is. I chose the game version, because I loved the detailed designs and tried playing the game (I imported it) before I saw the anime. In 2012, I created a human Rarity, from My Little Pony; Friendship is Magic, cosplay using a white dress, purple wig, and a bunch of accessories. This was the first costume I put together by myself, and to tell the truth, I think it needs a lot more work. This one was also a team project with my best friend, and she created a human Rainbow Dash. I still prefer working with my mother; it nice spending time with her while she’s doing something she loves, sewing. Also in 2012, my mother and I made my second “Tales of” series costume, Jade Curtiss from Tales of the Abyss. Costumes from this series offers us a challenge, because they can be rather complex. It’s not perfect, but I was really glad at how well this one came out. This year, I made my third “Tales of” series costume, Hubert Oswell from Tales of Graces f. The coat was very difficult, and I almost thought we wouldn’t get it done by the MA convention this past May. I did it though, whoo! 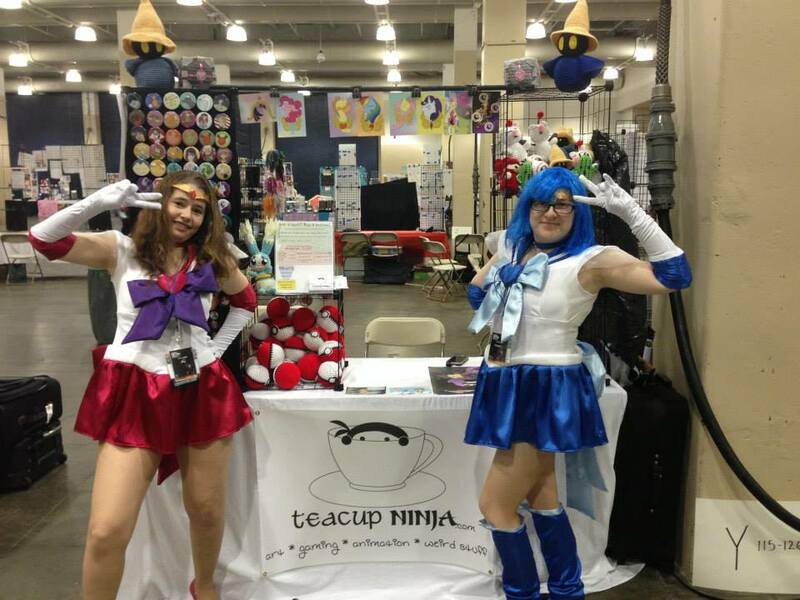 My mother and I also made a Sailor Mercury costume from the anime Sailor Moon S. I always wanted to dress up as a sailor soldier, and seeing all the new Sailor Moon merch lately got me thinking, I’m going to do it now. We managed to get that one done before the convention too. It wasn’t as easy as it looked though. When my mother and I started talking patterns we noticed that dance wear patterns (for the base leotard) were not easy to find. So, we had to design a lot more than we thought from ground zero. I was able to improve the Rarity cosplay, too. To me, cosplay is more about the craft of the costume than just walking around in it. I also compliment people on their work as well. I have tons of photos of random people wearing awesome costumes. It’s really a neat hobby. I will have posts about my new cosplay work when I get started on my next project. You can also follow me on Twitter, @phoebejtweets, and check out my Deviant Art page at http://phoebej.deviantart.com/. Thanks for reading! It’s Monday. Its Memorial Day. I dont have to be at work. This is a good thing because I’m now going thru the normal post-con crash. 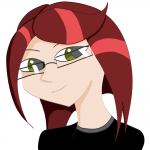 Yesterday afternoon I got home from Anime Boston and had an insane, crazy and awesome time…. Thursday was spent waiting with new friends for badge pickup. Got in early, pimped out our table to any of my friends, got my badge and proceeded to setup. Setup went mostly without a hitch. Got all the buttons arranged, got the plush all looking good. Got everything set up and sorted and ready. Thursday night was spent with friends being silly. Late night humor is some of the best. With Friday came Lightning Farron. I ran errands, I stopped for photos, I sent people to our booth, I proved once again that I can get enough food for 4 nerds who all have quirks and get it all back still too hot to eat. Overall a great day was had. Saturday brings us to Sailor Scouts. Phoebe and I did Mercury and Mars for our new cosplay. The photoshoot was a bust, but we still looked good. We still had a great time. Sadly between two days of boots and a day of heels, by this time my heels are completely blistered. So I take my turn at the table where I can be barefoot and no one cares. I sold lots of buttons. Talked to people and decided sometimes not running around is good. Saturday night was formal night and proof that Angie does indeed dress up sometimes. Again fun time. Sunday was My Little Pony day. 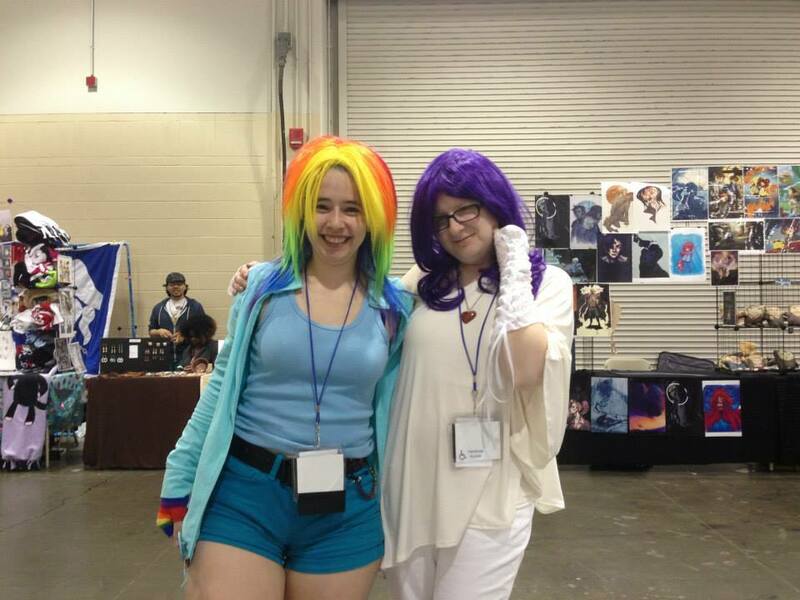 Debuted at AAC, 2012 Phoebe and I reprised our Rainbow Dash and Rarity cosplay. I sometimes have way too much fun as RD running around and doing silly things like “flying”.. ok bouncing over and under things. Breakdown and packing was painless and the overall analysis was that this year from a business standpoint was better than last year.